Retired neurosurgeon and potential 2016 Republican presidential candidate, Ben Carson, criticized the newly modified AP U.S. History curriculum being taught in America's high schools joking on Monday that after completing the course students would want to "sign up for ISIS." "I think most people when they finish that course they would be ready to go sign up for ISIS," Carson said to laughter from the audience. "I mean, this is what we are doing to the young people in our nation." He was speaking at the Center for Security Policy's National Security Action Summit. Carson falls in line with many conservatives that disapprove of the anti-American bias in the modifications the College Board made to the course's curriculum earlier this year. The course now places larger emphasis on the negative aspects of American history instead of the positives. 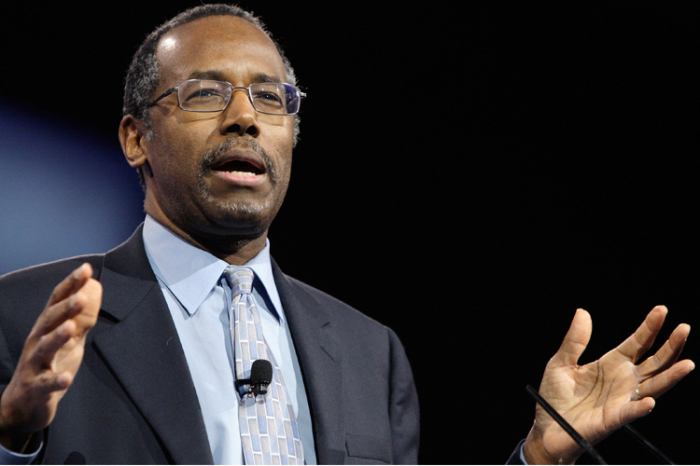 "We need to look at our history and we need to understand our history," Carson said. "I am a little shocked, quite frankly, looking at the AP course in American history that is being taught in high schools across our country right now." Carson claims the course teaches very little of the first American president and doesn't talk enough about the sacrifices during the Civil Rights Movement. Instead, Carson claims the course emphasizes the times throughout history when the U.S. persecuted and discriminated against minorities. "There is only two paragraphs in there about George Washington; George Washington, believe it or not, little or nothing about Dr. Martin Luther King," Carson said. "[There is] a whole section about slavery and how evil we are, a whole section on Japanese internment camps and how we slaughtered millions of Japanese with our bombs, a whole section on how we wiped out American Indians with no mercy." Carson said he thinks that courses like the new AP U.S. History are intended to atone for the nation's past mistakes. "We have got to stop this silliness. We have got to stop crucifying ourselves," Carson said. "Have we made mistakes as a nation? Of course we have. Why? Because, we are people and all people make mistakes." Stanley Kurtz of National Review Online claims that the curriculum modifications are designed teach history from a "leftist perspective." "This Framework will effectively force American high schools to teach U.S. history from a leftist perspective," Kurtz wrote. "The origins of the new AP U.S. History framework are closely tied to a movement of left-leaning historians that aims to 'internationalize' the teaching of American history." Jemelle Bouie of Slate.com finds no problem with the new curriculum. He writes that the new curriculum is designed to allow students to fully answer questions such as "How and why have moral, philosophical, and cultural values changed in what would become the United States?" "The standards are still filled with traditional history. The claim that students are losing the core ideas of American history education is false," Bouie writes. "In the AP U.S history practice exam, students are asked to read quotes from Capt. John Smith, Benjamin Franklin, George Washington, Thomas Jefferson, and Ronald Reagan." Although the College Board technically owns and designs the AP tests, they do not have any formal power to enforce schools to use their curriculum and some states and school districts are starting to avoid the AP curriculum although their students still need to take and do well on the AP test to get college credit for the course. Texas Board of Education approved a measure two weeks ago that will require its high school students to be taught a state-mandated curriculum. "In World War II there's no Holocaust, no liberation of concentration camps," Texas Board of Education member Ken Mercer told The Associated Press. "It's mentioned in Texas, but not in the [national] framework." The school district in Jefferson County Colorado, a suburb of Denver, tried to implement their own AP US History curriculum that highlighted patriotism and other positive aspects of American society. However, students from one area school protested the school district's headquarters after a teacher sick-out closed two area schools. Ben Carson Takes First Step to Potential 2016 Presidential Campaign; Will Gun Control Be His Achilles Heel?